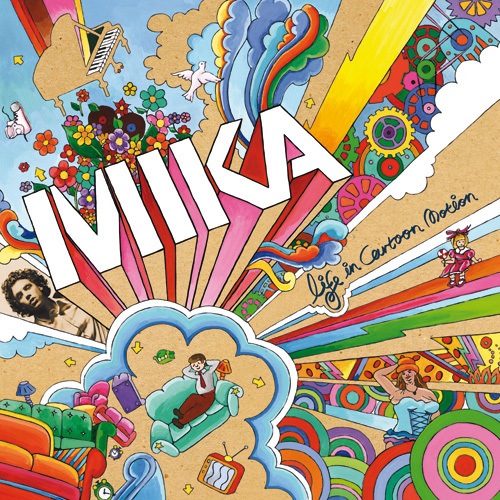 Just a glance at the album cover will tell you if Mika and his debut album, Life In Cartoon Motion, are right for you. It’s fitting artwork, though. This is bright, Technicolor pop with bouncy guitars, twinkling pianos, and an insistent rhythm section, all of it in the grand tradition of Elton John, Freddie Mercury, and, more recently, the Scissor Sisters. So for music so flashy, why is Mika’s debut so dull? To be fair, it’s not the fault of the first few songs. “Grace Kelly” was deservedly a global hit, an unrequited love song featuring an absolutely euphoric chorus. “Lollipop” and “Love Today” follow suit and succeed, albeit to a lesser degree. But right after the fine, hypnotic “Relax (Take It Easy),” Life In Cartoon Motion begins to nosedive. Some of this has to do with the way Mika sings. Clearly, his touchstone is Freddie Mercury (“Grace Kelly” even namechecks him), but whereas Mercury was self-aware and knew how to frame his theatrics in equally bombastic arrangements, Mika affects his voice like a Broadway actor, making his attempts at sincerity sound forced and artificial. This is particularly the case on the saccharine ballads “Happy Ending” and “Any Other World” and on the MOR pop/rock of “My Interpretation” and “Erase.” The lack of earnestness continues elsewhere, sinking otherwise well-meaning pop songs like “Billy Brown”‘s tale of a closeted man and the love-your-body anthem “Big Girl (You Are Beautiful).” Sure, Mika may mean what he is saying, but it sounds like a put-on, draining the songs of both weight and feeling. While the music itself has interesting quirks and arrangements, Mika tries a bit too hard and a bit too much, and when “eclectic” starts slipping into “erratic,” the songs lose their hooks and their focus. It’s clear he has potential as a singer and songwriter (the best moments on the album make that clear), but other than the occasional highlight, there isn’t much here to sink one’s teeth into.